My husband likes to make fun of my alliterations. If we were having this conversation out loud, my husband would now say, "That's quite quaint, honey, but what is alliteration again?" I know, I'm an English nerd, but food sounds are just as fun as food tastes in my opinion, and I'm now convinced that blackberries and balsamic vinegar were matched up in heaven. Aside from drinking it right out of the bowl, I like to pour my alliterated sauce on ice cream, as well as fish or chicken. 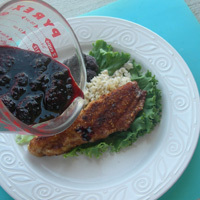 Ashley has created a wonderful variation of this sauce that is strained called Berry Balsamic Drizzle. For this recipe, I like to leave the berries in the sauce, but otherwise the directions are identical. In a small saucepan boil vinegar and sugar. Reduce heat and simmer two minutes. Add 1 C blackberries and bring to a boil. 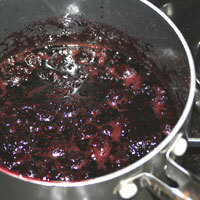 Reduce heat and simmer 5 minutes until berries fall apart. Set aside to cool and thicken. 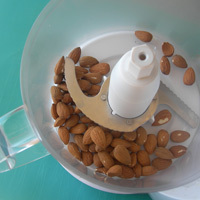 Process almonds in a food processor until they are very fine. 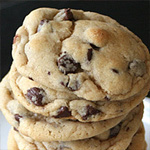 You can also buy almond flour at the health food store. This is as fine as I can go with my machine. If you don't live with nut haters like I do, leave a bit of chunk. 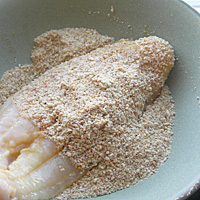 Add 1 C bread crumbs, 1/4 t kosher salt, and a dash or two of pepper to a wide bowl. Wisk three eggs in another bowl of the same size. Rinse off your fish and pat dry. 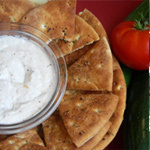 While a dry pan is heating over med high heat, dip your fish in egg. Next, dip fish in almond mixture to coat. 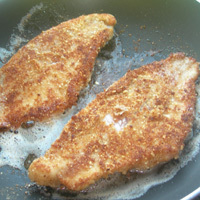 Add enough oil to lightly cover the bottom of your pan and place fish so they are not touching. 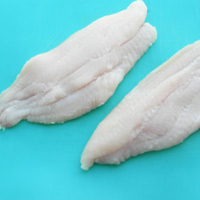 Work in batches so you do not overcrowd the fish and ruin the crust, cooking each side for 2 to 3 minutes. Serve with brown rice and the Blackberry Balsamic Sauce. In a small saucepan boil vinegar and sugar. 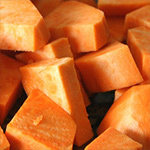 Reduce heat and simmer two minutes. Add 1 C blackberries and bring to a boil. 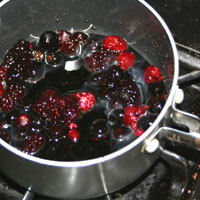 Reduce heat and simmer 5 minutes until berries fall apart. Set aside to cool and thicken. 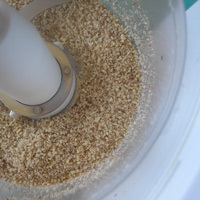 Process almonds in a food processor until they are very fine. You can also buy almond flour at the health food store. 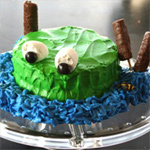 This is as fine as I can go with my machine. If you don't live with nut haters like I do, leave a bit of chunk. 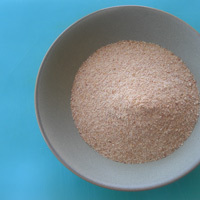 Add 1 C bread crumbs, 1/4 t kosher salt, and a dash or two of pepper to a wide bowl. 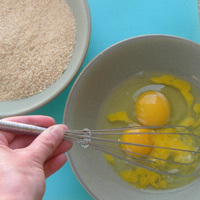 Wisk three eggs in another bowl of the same size. Rinse off your fish and pat dry. 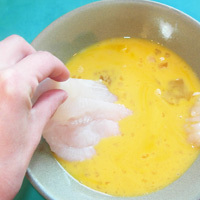 While a dry pan is heating over med high heat, dip your fish in egg. Next, dip fish in almond mixture to coat. 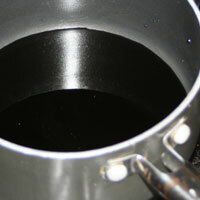 Add enough oil to lightly cover the bottom of your pan and place fish so they are not touching. Work in batches so you do not overcrowd the fish and ruin the crust, cooking each side for 2 to 3 minutes. Serve with brown rice and the Blackberry Balsamic Sauce. Note: Kosher salt does not contain the same amount of saltiness as table salt. Table salt is actually stronger, so adjust your seasoning accordingly. Since you can't measure 3/4 of a 1/4 t Kosher salt, I would just estimate with a table salt substitution and use a bit less.